The crew of USS Theodore Roosevelt (CVN-71) finished clearing clogged seawater intakes to allow the ship to depart for a Middle East deployment, Navy officials told USNI News on Wednesday. The carrier was sidelined for two days while sailors cleared the intakes of marine growth. The ship will now move to catch up with the rest of the carrier strike group (CSG) that departed on time. USS Normandy (CG-60), the guided-missile destroyer USS Forrest Sherman (DDG-98) and USS Winston S. Churchill (DDG-81) left Naval Station Norfolk while USS Farragut (DDG-99) departed from Naval Station Mayport, Fla. 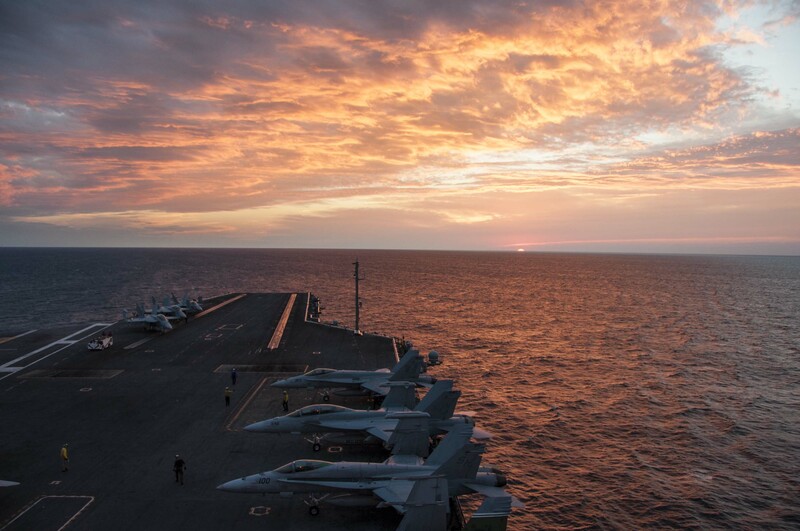 The combined Theodore Roosevelt CSG is set to relieve USS Carl Vinson (CVN-70) and its compliment currently in U.S. 5th Fleet supporting Operation Inherent Resolve (OIR) — the U.S. led collation conducting airstrikes against the Islamic State in Iraq and Syria (ISIS or ISIL). Following the deployment, the carrier will continue to Naval Station San Diego, Calif. as part of a carrier swap that will move USS Ronald Reagan (CVN-76) to Japan setting up current forward deployed carrier USS George Washington (CVN-73) for its planned mid-life refueling and complex overhaul (RCOH) in Newport News, Va.
Roosevelt just completed its own RCOH last year and is currently the most technologically advanced carrier in the U.S. fleet. The deployment will be the first of a Naval Integrated Fire Control-Counter Air—or NIFC-CA (pronounced: nif-kah) capable CSG. The scheme connects the carrier, Normandy and a deployed squadron Northrop Grumman E-2D Advanced Hawkeyes to create a targeting network that extends the lethal reach of the CSG. The following is the March, 11 release from the Roosevelt CSG. The Nimitz-class aircraft carrier USS Theodore Roosevelt (CVN 71) departed its homeport in Norfolk for an around-the-world deployment, Mar. 11. TR and its Sailors will conduct operations in the U.S. Navy’s 5th, 6th and 7th Fleet areas of responsibility during the deployment. The deployment is part of an ongoing rotation of U.S. forces supporting maritime security operations in international waters around the world. Working with allied and partner maritime forces, TR will focus heavily on maritime security operations and theater security cooperation efforts, which help establish conditions for regional stability. The Theodore Roosevelt Carrier Strike Group (TRCSG) consists of Carrier Strike Group (CSG) 12, TR, Carrier Air Wing (CVW) 1, Destroyer Squadron (DESRON) 2 staff, the guided-missile cruiser USS Normandy (CG 60), and the guided-missile destroyers USS Farragut (DDG 99), USS Forrest Sherman (DDG 98) and USS Winston S. Churchill (DDG 81). The five ships and nine aircraft squadrons of TRCSG consist of approximately 6,000 Sailors and Marines who have spent the last year conducting intensive training and certification exercises to establish a safe, cohesive organization capable of performing a wide variety of missions across the globe, ranging from counter-piracy and ground support operations to humanitarian assistance and disaster relief. TR’s deployment will be a world tour, which will end with her completing a homeport shift to San Diego. TR’s change in homeport is part of a three carrier shift involving the USS Ronald Reagan (CVN 76) and the USS George Washington (CVN 74). Theodore Roosevelt, named in honor of the 26th U.S. President, was commissioned Oct. 25, 1984 as the 4th Nimitz-class aircraft carrier.